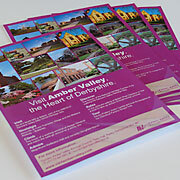 There is something for everyone in the Amber Valley. Whether you enjoy browsing round market stalls or prefer looking for bargains and being the first to enjoy new designs at our Factory Shops, you will discover a wide selection of shopping in the area. Market towns such as Belper offer a range of independent and speciality shops, unique gems nestled in the streets together with farmers markets for those wanting to pick up seasonal produce. The four market towns of Amber Valley, Alfreton, Belper, Ripley and Heanor host a broad range of retail shops from smaller independent traders and family operated department stores to well known high street names. The grand old mill of De Bradelei Stores and the courtyard complex at the Denby Pottery Visitor Centre offer a relaxing environment to make a day of your retail therapy. The range and diversity of leading manufacturers based in Amber Valley has helped to establish the Amber Valley Individual Shopping Trail for those who love a bargain. Companies including John Smedley and David Nieper have shops in the area. Their outlets offer excellent value for money and a huge variety of merchandise. There are sometimes products available that you are unable to purchase elsewhere including design samples and end of lines.